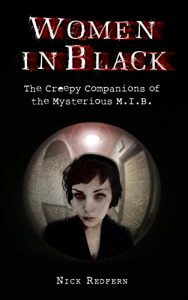 Nick is of course an old friend and having him on the show is just an excuse to catch up and talk shop, although we spent an amazingly substantial amount of time on his new book: Women In Black: The Creepy Companions of the Mysterious M.I.B. Nick can say whatever he wants to on my show and he did. We spoke quite a lot about Albert K. Bender and his occult interests and experiences, and a bit about his involvement with alchemy, of all things. The subject of fairy lore came up, and some of the similarities to aspects of visits from the Women In Black. Nick found that these entities, while having a similar M.O. to their male brethren, tend to act more like what we think of a vampires, at least in their theatrical aspects, being more seductive and less overtly threatening. We even got to a case of a woman in white who harassed a witness to an apparent whale mutilation in the UK. This entry was posted in Authors, books, contactees, Government, Intelligence and tagged Albert Bender, alchemy, fairy lore, MIB, Nick Redfern, Women In Black. Bookmark the permalink. Greg – u know u got featured nationally on History channel? I think it was. I taped Mirage Men – so I can show my mind-controlled relatives. haha. Thanks! Awesome.